Since 2007 Environment Canada, has required senior federal scientists to seek permission from the government prior to giving interviews, often requiring them to get approval from supervisors of written responses to the questions submitted by journalists before any interview. “Many [federal climate change] scientists are recognized experts in their field, have received media training, and have successfully carried out media interviews for many years,” said the document, leaked by an Environment Canada employee who asked not to be named. Canadian scientists have told IPS they required permission from the prime minister’s communications office to comment on their own studies made public in scientific journals and reports. If permission is granted, it requires written questions submitted in advance and often replies by scientists have to go through a vetting process. Within six months, reporters stopped calling and media coverage declined, the leaked report noted. This policy is detrimental to the public, and should be opposed by all all Canadians, even conservatives. True conservatives should be outraged that their tax dollars are being spent, and subsequently wasted by ensuring that anything learned isn’t put to good use. In its budget [earlier this month], the Harper government provided no new money for the Canadian Foundation for Climate and Atmosphere Sciences. The foundation is the country’s main fund for scientists studying everything from global climate models, to the melting of polar ice and frequency of Arctic storms, to prairie droughts and shrinking Rocky Mountain glaciers. For many in the research community, the budget decision merely confirmed the view that Prime Minister Stephen Harper and his government remain skeptical of climate-change science and hostile to those who provide evidence that aggressive action must be taken to avert catastrophic global warming. “It’s quite clear we have a government that says they believe this is an issue but really don’t care about it,” said Andrew Weaver, a world-renowned climatologist from the University of Victoria. The foundation was endowed with $110-million nearly 10 years ago under the former Liberal government, but will run out of money by early 2011. As a result, scientists must wind up their projects. “There is nowhere to apply for more money,” said James Drummond, a Dalhousie University physicist who is principal investigator for the PEARL project. 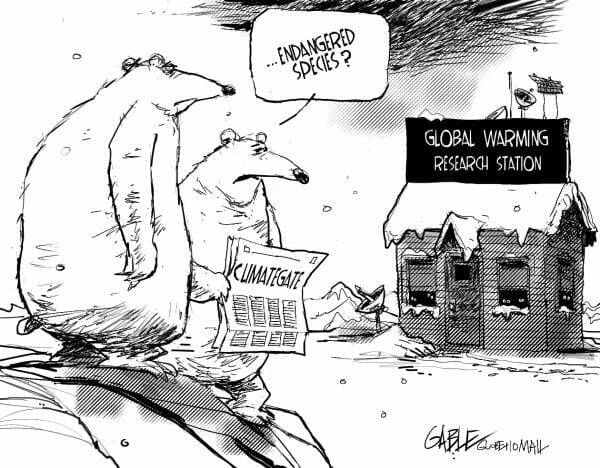 Environment Minister Jim Prentice insists the government remains committed to basic research on climate change. He said the foundation has been operating for 10 years and it is now time to assess its work. Prentice’s excuse is absurd. It doesn’t even make any sense. One doesn’t shut down (which is costly), conduct a review and then if the review goes well start up again (which is even more costly). Once conducts a review while the operation is running, and if it is deemed an acceptable use of tax dollars (which in my books it is) then more funding is granted. Unless of course one isn’t interested in ensuring tax dollars are wisely spent, but rather in shutting down science that goes against the party ideology. In which case it makes perfect sense, and is completely indefensible. There are many non anthropogenic global warming related reasons that a deep understanding of climate is important. Canada’s arctic is changing fast. Understanding this change is vital to ensure we can adapt and benefit from it, also many regions in Canada have water supply issues (the parries in particular), understanding climate trends (be they natural or anthropogenic) is vital in ensuring our water supply and infrastructure meet our needs. And There are countless more examples. These reasons necessitate an understanding of climate (especially at the regional level), and the Conservative policy on the matter is ensuring that there will be a data deficit, which will undoubtedly lead to bad policy. Not to mention that as the funding dries up, the country’s capacity to make use of the oft-touted High Arctic research station station will be lost. Thus more tax dollars will be wasted. In less than 12 months, major research collaborations among industry, government laboratories and universities will collapse – and with them the jobs of numerous scientists, students and technicians. The country is already bleeding talent…Without sound scientific information, how will the government evaluate the effectiveness of green technologies, or build northern infrastructure, or develop our energy industry, or assure water supply and clean air? None of this is acceptable. It reeks of a government who says one thing, while doing another as secretly as possible. All Canadians should stand up against such irresponsibility, especially now when the case for global warming has never been stronger. Only partisans will find this behaviour excusable. Quote of the day, with comic!